A new report, “Building a Foundation for Success,” looks at the unmet preschool needs of children in the commonwealth — and proposes three ways that Massachusetts might expand its preschool programs to create more access. Released by the Massachusetts Budget and Policy Center (MassBudget), a nonprofit research organization, the report examines the number of preschool-age children in Massachusetts and the public funding streams that support their enrollment. The report costs out “a range of options for expanding and improving early education and care for these 3- and 4-year-olds in Massachusetts.” The options proposed range in cost from $153 million to $606 million in increased annual state funding on top of what is currently being spent. This increased state funding would be bolstered by non-state sources such as sliding scale parent fees or local education funding, depending on the model used. “Right now we have a very fragmented system and that leaves many kids without access to any early education at all,” Noah Berger, MassBudget’s president, told the Boston Globe. However, Berger added that there was a growing consensus that a wide expansion of early education options was good for children and for the economy. 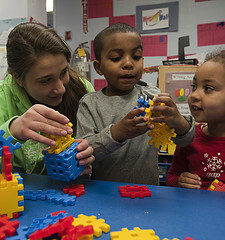 Defining the Need: How Many Massachusetts Children Are in Preschool? Based on an analysis of U.S. Census Bureau data, MassBudget estimates that there were roughly 158,000 3- and 4-year-olds living in Massachusetts in 2012. “For kids below 200 percent of poverty,” the report says, “roughly one-third receive no public support to help fund their early education and care.” These families would probably benefit the most from expanded early education and care programs — especially those low-income parents who are struggling to pay full private rates to enroll their children in preschool programs. To estimate the cost of option 1, expanding through private providers (nonprofit and for-profit center-based early education programs), MassBudget used a sliding family fee scale and came up with two models. Option 1a: Provide affordable early education and care for all lower-income children through private providers, at current EEC subsidy rates or with quality improvements. Cost: $440 million = $153 million in state funds + $288 million paid by families. Outcome: state subsidies for 52,000 children in the “families at or below 400 percent of federal poverty” who do not currently receive public support (such as Head Start, EEC subsidy, public school pre-k) for their early education and care. Importantly, this model de-couples eligibility from parental work status (current federal/EEC requirement), relying solely on family income. It is important to note that this option would do little to address program quality. As the report points out, current rates (roughly $8,500 per preschool-age child per year) are not enough to sustain program budgets or pay and retain highly qualified teachers; therefore most programs raise supplemental funds to balance their budgets, and admit private paying students if possible. The report acknowledges the cost of delivering higher quality pre-k in its next two cost models. Option 1b: A second way to expand access for lower-income children is to tie state reimbursement rates to the quality improvements that preschool providers make. Both models below would serve the same 52,000 children, 3- and 4-year olds currently receiving no public support for early education. State reimbursement rate increased to $12,900, a level equivalent to what 75 percent of private providers charge, and roughly equivalent to the per-pupil allocation for New Jersey’s high-quality pre-k program. The second option proposed in the report is an expansion of preschool through public schools. MassBudget’s report says, “This route would more closely integrate the education and care of 3- and 4-year-olds with the educational system designed to support them during their K-12 years.” Public school preschool would likely adhere to local school district requirements for teacher salaries and credentials. However, unlike community-based programs, public school pre-k typically defines “full-day” as only 6 hours, and does not run during school vacation or summer months. Outcome: universal full-day pre-kindergarten for 105,500 children currently receiving no public funding support for early education. Rather than making a cost estimate about expanding hybrid systems, MassBudget points to two promising examples in Boston and New Jersey and highlights features of each program that could be duplicated. – program directors receive support in delivering professional development for their teachers. In New Jersey, the Abbott preschool program is the result of a 1980s court order that mandated fully-funded early education for 3- and 4-year-olds in 31 cities and towns. – all districts are required to offer the option of full-day kindergarten. Now Massachusetts has to create its own map for preschool expansion and improvement. on October 15, 2018 at 1:56 AM | Reply How to get the equation right on early education funding? | Your high education waits for you!